In 2015 we enjoyed our 16th Sabra/Sabre meeting over the weekend of 12th/13th September. Many thanks to Tony and Linda for organising an excellent event, based in Congleton, Cheshire. On Friday afternoon we all met up at Tony and Linda’s house where we enjoyed a cup of tea and a cake. 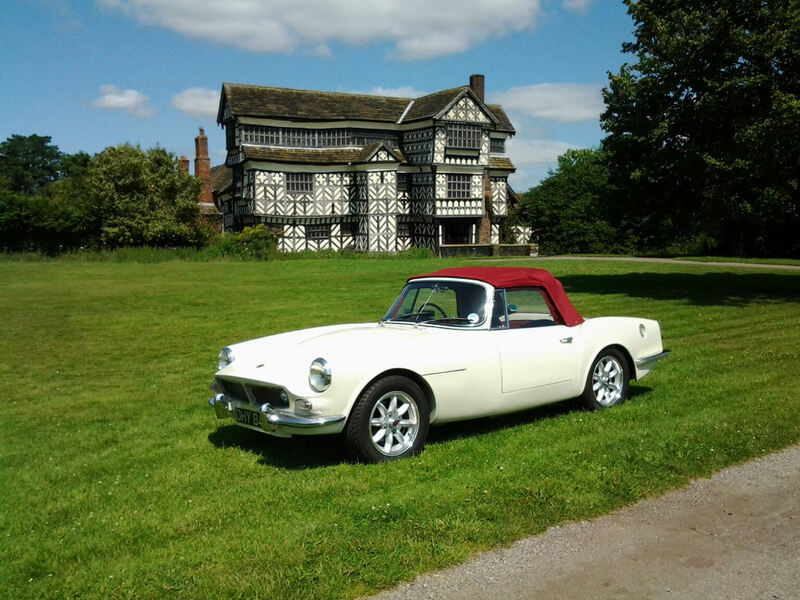 The payoff for Tony was that we helped him lift from its chassis the body of his new Sabra restoration project. This revealed a very sound looking chassis. Later we all gathered at our hotel for the weekend, The Plough, in time for a drink or two before we enjoyed a relaxing dinner. 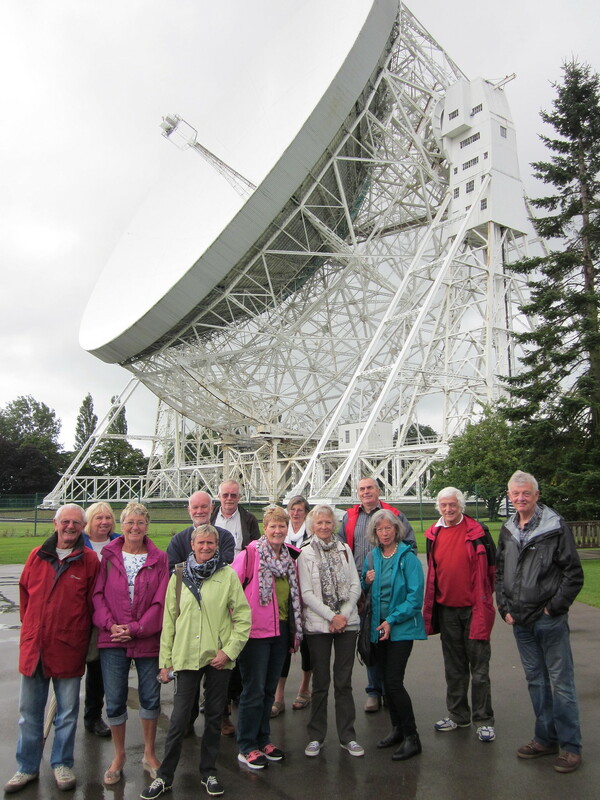 Saturday morning saw us setting off on the short journey to the Jodrell Bank Observatory. What a fascinating place. We were most impressed to realise that despite its 50 plus years the main 38 metre telescope is still being used for serious research today. In the afternoon we visited Little Moreton Hall, an iconic Tudor manor house built and extended over the period 1504 to 1610. The house seemed to have no walls or floors that were straight or level. On Saturday night we enjoyed an excellent dinner at the English Dining Room near Holmes Chapel. The usual hilarity prevailed! Tony and Linda had wisely arranged a small fleet of taxis to ferry us the six miles back to our hotel after the meal. On Sunday morning we drove towards Manchester to visit Quarry Bank Mill, a cotton mill built in 1784 which now overflows with the atmosphere of the Industrial Revolution. The mill was powered by what is still Europe's most powerful working waterwheel. The clattering and whirring of the heritage machinery and steam engines made an astonishing noise. Of particular interest was a guided tour of the Apprentice House, which housed the pauper children who worked in the Mill. Our guide was a very nice goblin of a man who delighted in ribbing Vin at every opportunity, but in a gentle and amusing way. If all that wasn’t enough there were also stunning gardens to explore. A single day really wasn’t long enough to fully enjoy all that Quarry Bank Mill has to offer. Returning to our cars, it was nice to meet up with local Scimitar Coupé owner Dave Robert and his wife. To keep us from getting bored during our drive on the Sunday, Tony and Linda had devised a quiz. We had to solve a number of roadside clues along the defined route followed by a number of Reliant specific general knowledge questions. The two Geoffs, Cooper and Richards were the worthy winners, making the most of their extensive knowledge of Reliant and RSSOC history. We all departed for home on Monday morning. Again we stretched our 200 odd mile journey home over two days, detouring to the Cotswold’s beautiful Stow-on-the Wold for an overnight stop. It’s fair to say that the weather over the weekend was mixed. We had a little rain on Saturday but Sunday was warm and sunny. However on Monday we drove through torrential rain, but were very pleased that our Sabre convertible kept virtually all of the rain out. No carpet drying was necessary at the end of the journey. As usual all our cars were pretty reliable over the weekend. Bernard had a few problems, triggered by a loose dynamo which apparently sounded like a dying engine. 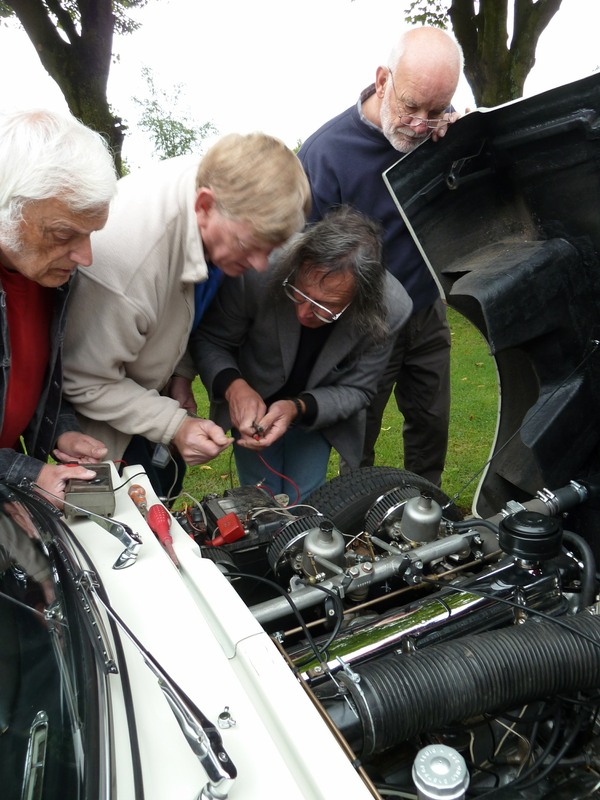 With the usual enthusiastic input from numerous experts the car was soon returned to full health. After saying our goodbyes on the Monday morning our car suddenly stopped a few yards from the hotel with no electrical power to anything. A quick diagnosis, again with help from our friends, revealed a dodgy earth strap connection to the chassis. This was quickly remade and we had no further problems. Only two couples have attended all 16 of our Sabra/ Sabre meetings, Jef and Els from Antwerp and us. However, if there was a prize to be won it would go to Jef and Els who have attended all of these event with their trusty blue Sabra. In contrast we have used a total of seven different cars: a borrowed Sabre Six in 2000, now Chris Gallachers’s car, a TVR Chimera in 2001, our son’s car at the time, our SE6a in 2002, our sprint and hillclimb Scimitar Coupé in 2003, our lovely red Sabre Six 461WYD between 2004 and 2010, our Sabre Six Convertible 700RUR (four times) and the Prototype CBF941 (twice) between 2011 and 2015.